Soccer is available to all students in grades 1 through 8. Soccer is a co-ed sport, with boys and girls playing on the same team at all age levels. 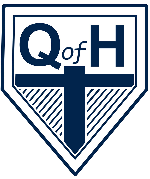 Queen of Heaven participates in the Father Baker Soccer League, which takes place during the Fall Sports season. The league's games begin in early September, usually the first or second weekend of school. The league games end at the end of October. Games are played once per week, usually on either Saturday or Sunday afternoons. Practice schedules are determined by each team's coach, but are usually held on weekdays (either right after school or in the evenings). Practices are held at one of the two soccer fields behind Queen of Heaven School. Rosters for all QOH soccer teams are generally finalized in mid-August so that teams can begin practicing before school begins in order to be ready for league games. The Father Baker Soccer League is split into 4 age groups: 1st-2nd graders (Mites), 3rd-4th graders (Peewee), 5th-6th graders (JV) and 7th-8th graders (Varsity).